As Christians, we have a very long history of faith, one that even exists well before the “New Testament”. To deny such or be blind to such is a dangerous thing, no doubt. I’ve shared on this before and really don’t need to reiterate a whole lot at this point. But, at the same time, Christ is still preparing his church, his ekklesia, to be what he called us to be. You can see something of this in an all-important passage like Eph 4:11-16 – certain ministries helping the body of Christ move towards unity and maturity. And so, our lot in life is change, continued transformation. That is our call whether we like it or not. I’m am always astounded that Jesus did not arrive on the scene to simply maintain the status quo. The people of God at that time held to certain beliefs and dogmas and models that were paradigmatic for them, even part of the faith tradition carried on for centuries, if not millennia. But they were not the end all, be all, do all. A new paradigm was about to be set in motion by God’s anointed Messiah-King. The normal status quo amongst God’s people could not remain if God’s greater purposes were to be accomplished. And such set a precedence for the rest of this age. God’s people could not then and cannot now remain where they are. And church history shows us that certain paradigmatic shifts have taken place over the centuries – some quite earth-shattering and some simply consistent change that was definitely called for. Therefore, we need to continue to reevaluate where we (we, not you and I individually) are. 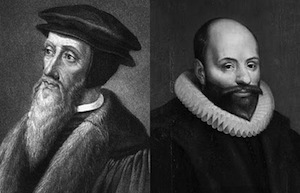 One paradigm that served its purposes in the past, even up to the recent past, but I believe needs to be swallowed up by another paradigm, is that of the age-old Calvinist-Arminian debate. I believe it is simply time to move on from such. Thankfully, at least as I can tell in what I personally read and within my own context, this debate (or discussion) is not so prominent anymore. But it keeps popping its head up here and there. And I always wonder why. What purpose is it serving today? You see, this is odd for me, as I was a staunch believer in many things reformed-Calvinist some 8-10 years ago. But that has slowly washed away due to reflection and reading of things wider than a particular vein. And, even though I have come to listen to and respect more Arminian theology, I am not even trying to move towards such a theological view. The reason – it’s time for a whole new paradigm. And the answer isn’t so much that we need another set of terms (i.e., I’m not saying open theism is the answer). I just simply believe the age-old Calvinist-Arminian debate will not serve the church, nor the world, in this 21st century. For some, there is a desire to bring about a resurgence of these. I must respect that desire and allow for it. I simply share that the church, as a whole, will no longer be polarised by whether one is Calvinist or Arminian. Such, in the bigger picture, is over and done with. There are other paradigms that must and will change – our understanding of the gospel and the kingdom, our understanding of new creation outside of personal salvation, our understanding of church in a post-modern context, our understanding that Paul cannot be read through a post-reformation lens, etc. And actually, if you have taken notice, you will realise such change has already begun. But, I think we need to take some time and reflect that one good paradigm has served its purpose and must now be put to rest. That is definitely the one of the Calvinist-Arminian approach to soteriology, our understanding of salvation (and everything else that is connected to such). We can keep holding on to such. But I am not sure it will really serve the church nor the world in the day and age we live in. It’s time to move from the old paradigm and consider what new paradigm God is stirring. This entry was tagged Arminianism, Calvinism, change. Bookmark the permalink. Time to move on… although people will have their own view on the workings of calvanism or arminianism, they have already concluded their stance. It is somewhat by the by as to what you adhere to. The most relevant stance is that we do that which Jesus calls us to – whether we hold one view, a different one – or indeed another. How we do the stuff of the Kingdom has to be the most relevant debate for today. I know I cannot change my friends view just by explaining what I believe, but we can both work together to advance the work of God. It is faith – in action and belief and seeing the works of God occur via faith, hearing the voice of the Spirit and being obedient to it, moving in the fruit and also the gifts of the Spirit, that will make the church be that which it is supposed to be. If it is this we do and walk in love, obedience, mercy, kindness, humility, integrity, honesty, power, servanthood, peace, joy, wisdom and love mercy and act justly and just go walking humbly with God, then the church works. well. Amen to “change”, “In Spirit and truth”! But the best of the Reformation and “Calvinism” is also changing somewhat, but never to the movement against the presupposition of the Holy Scripture itself! Note here the work and theology of a John Frame, etc. And some aspects of the Federal Vision, etc. Certainly no perfection here, but indeed spiritual change and movement, in biblical & systematic theology! It is ironic how Calvinists claim Sola Scriptura, yet their beliefs are based on a doctrine that is nowhere in the scriptures. Nowhere in the scriptures does it say humans cannot believe in God on their own without the Holy Spirit enabling. If all were like the Bereans, they would have searched the scriptures to find where it says humans cannot believe in God on their own without the enabling of the Holy Spirit. They would not find that anywhere, but you would find how Jesus died for “all men,” for the “whole world,” and for “whomever” would believe. Please see John 3:16; John 3:36; 1 John 2:2; John 1:6-13; 1 Timothy2:3-6; Titus 2:11; 1 Timothy 4:10. Repent of believing false doctrines, move on, and grow in the Lord. Calvinists depend on John 6:44 to support their false doctrine. They misunderstand about the drawing of God. The Old Testament believers in God were God’s people. Not all Old Testament Jews were true believers. The people who believed in God, God gave them to Jesus. God’s people who believed in Him, they now had to go through Jesus in faith to continue with God, this faith in Jesus made them perfect. They are the people who God enabled to come to Jesus during Jesus’ ministry on earth. The Jews who did not believe in God, God hardened them so they were not able to come to Jesus. The people who are drawn to Jesus, they are drawn because they are all ready believers in God the Father. The people who believe in God, they recognize what Jesus says as God’s word, and in this, they are drawn. John 6:37 All that the Father gives me will come to me, and whoever comes to me I will never drive away. John 6:44, 45 “No one can come to me unless the Father who sent me draws them, and I will raise them up at the last day. 45 It is written in the Prophets: ‘They will all be taught by God.’ Everyone who has heard the Father and learned from him comes to me. Thanks for stopping by and commenting. I am not sure we can unequivocally label Calvinism as ‘false doctrine’, in that false usually refers to deception. I think Calvinists need to rethink their theology at certain points. But I think it way too far to label it ‘false’ doctrine. Amen Scott! As one that is an Anglican Reformed, but FV (Federal Vision) friendly, there are actually different “Calvinist’s”, and Reformed. People need to see the depth of the Reformed Creedal history for example, note the Scot’s Creed. I myself prefer the Irish Articles 1615. But as I have written, the “unio mystica” is simply the “uno personalis”, for the biblical-theological Christian. And note Barth is even within the “Reformed” label. I am not a Barthian myself, but there is a Calvinist group who claim his theology somewhat. But, truly, I have been hammered myself by some of the ultra Federal Calvinists, they hate and misunderstand the Federal Vision! Calvinism is a false doctrine, it goes against the Word of God, and it causes division. Calvinism keeps people from growing in the Lord, which that in itself has many ramifications. These are no small matters. Your personal attack on my defense is only that, a personal attack tainted by your personal opinion. God is Sovereign. God’s Word came FIRST, and His Word came to me, my Master said do this and do that, I did as my Master said to do. How do my beliefs make God not Sovereign? Your indoctrination has blinded you to the Truth. Now come to your senses! To give some possible objective insight, AMG, your comments do come across more reactionary than balanced. Again, I don’t think Calvinism has it all. But it cannot be labelled false doctrine, since false, in the biblical sense, focuses in on deception and evil intent. While you and I might want to argue that Calvinism is somewhat off-based in some points, I don’t think it came out of evil, deceptive intent. With all due respect, I think I have stepped into a site with people confused about word definitions. Maybe you need to look up the exact meaning of reactionary. In addition, what does the word balanced have to do with telling you the truth? 2 Corinthians 11:4 For if someone comes to you and preaches a Jesus other than the Jesus we preached, or if you receive a different spirit from the Spirit you received, or a different gospel from the one you accepted, you put up with it easily enough. There is a difference between contending for the faith handed down to the saints and arguing that a particular soteriological understanding (i.e., Calvinism) is false doctrine. In the Bible, false doctrine (and false teachers) have to do with those with malicious intent, deception, evil purposes. Calvinists are not inherently trying to deceive or build a malicious theological perspective. It is simply an honest attempt at gathering the Scripture’s teaching on salvation. Again, I don’t agree with some points of Calvinism. But, from a biblical perspective, we cannot inherently label Calvinism as false doctrine because, again, it is not coming forth to deceive. So let us contend for the faith, let us look to have true doctrine. But let us also not begin labelling everyone within historic, orthodox Christianity as false because we don’t agree with some of their points. I don’t believe that is going to be a Christ-centred approach. In 1 Timothy 1:3-4, does it sound like the certain men teaching “false doctrines” are teaching about genealogies out of evil intent? As I urged you when I went into Macedonia, stay there in Ephesus so that you may command certain people not to teach false doctrines any longer 4 or to devote themselves to myths and endless genealogies. Such things promote controversial speculations rather than advancing God’s work—which is by faith. I’m really not trying to pick a fight here. Nor am I trying to be judgmental. I simply wanted you to guard your heart from claiming that Calvinism was false doctrine (i.e. heresy). That is a big and major claim. There are a lot of true, faithful and biblical followers of Christ who hold to the essentials of our Christian faith but also see Calvinism as the best way to understand the teaching of Scripture on certain aspects of salvation. This is not heresy, even if we disagree. And I do agree with you very much that it isn’t just about intent, it is about content. John (in 1 John 4:1-6) really challenges the anti-christ spirit of denying that Jesus Christ has come in the flesh (the content of belief). But when we start at ground level, realising certain people do hold to the historic Christian faith (like Calvinists), we then start to secondarily consider motive. And a false prophet in the OT was identified not just by missing a prophecy. It was about speaking presumptuously and calling the people to go after other gods (Deut 18). There was deceptive motive. So we can challenge Calvinism with biblical teaching. But I would encourage you to not identify Calvinists as inherently false teachers. Calvinism is full of false doctrines. The Word of God says not to go beyond what is written, not to add or subtract, or to lean to the left or the right of God’s word. Those who teach Calvinism teach a different Jesus than the one in the Bible. They twist what the word says. Calvinists say Jesus did not die for “all men.” Calvinists say Jesus did not die for the sins of the “world.” Calvinism goes against the deep things of God. Calvinists make God responsible for the sins of the world. Unfortunately, I thinking you are characterising all Calvinists by one particular stringent strand of it. We must also guard our heart against them. Having once been a Calvinist, I can tell you that I would not agree that what you have said actually describes what I particularly believed. I was a Calvinist for a time. You are in denial what Calvinists believe and thus misleading others. Just because you go against what I say about Calvinism, that does not make you right. Calvinists believe that humans cannot believe in God on their own, not without the Holy Spirit first enabling them to believe and have faith. Are you going to continue to say I am not speaking the truth? Whatever you believe now? it just appears to be an overt “biblicism”, quoting verse, but not interpreting it. Your whole effort is poor ad hoc at beast. We should simply go to the Scripture itself, but seek context and exegesis. And I would heed Scott’s words, written well to my mind, and yes this is “his” blog! I could not care less what you think of me. You go against the Word of God, so it is no wonder that you go against me. I gladly leave and not come back. Ok, let’s close this one down guys. We are getting too defensive. But amazing lack of logic and thinking with AMG, another type of “Judaizing” it seems, unless you believe what I believe your not following Scripture period, sounds like another “fundamentalist”!